The Novation Launchpad has had its fair share of hacks, modifications and alternate uses, but that's exactly the reason why people love it. Now if you're a Renoise user you can download the Lauflicht Step Sequencer Launchpad Edition by developer Cie. 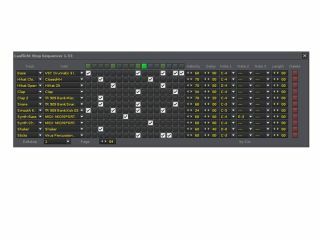 The plug-in costs €24 but there is also a free version available which is a fully functional plug-in with all the features mentioned above, except the Launchpad features. If you do not have a Launchpad or would like to test the plug-in, this version is for you. Full press release below. The Lauflicht Step Sequencer Launchpad Edition is a moving light, multi-track and multi-timbral step sequencer with 8, 16 or 32 steps, turning your Launchpad into a Hardware Step Sequencer. It was especially designed for playing live, to be capable of editing beats/patterns without the mouse, and to jam around having a nice and quick method to set the notes of a pattern. You can use as much tracks as you like, use your own samples, VST instruments or MIDI instruments for each track and control every note of them with your Launchpad. You can navigate through the pattern, change resolution modes, and scroll through the tracks with the buttons of the Launchpad. The Lauflicht Step Sequencer Launchpad Edition just turns your Launchpad into a Hardware Step Sequencer.